EasyTouch™ iPhone and Android Smartphone Applications - Micro-Air, Inc. The EasyTouch iPhone & Android Application is Micro-Air's latest addition to its remote monitoring & control capability. 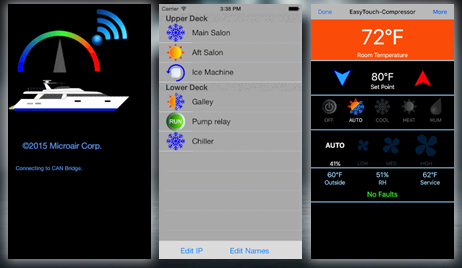 EasyTouch has taken the lead in the marine HVAC control industry with optional integrated Wi-Fi support. Whether it be controling your A/C settings while aboard, or monitoring your A/C from across the internet, the EasyTouch iPhone or Android applications allow you complete control. The AirNet5i™ iPhone Application provides remote monitoring and control of all Micro-Air products that AirNet™ CAN bus networking when interfaced to the a local Wi-Fi and or to the internet via our AirNet™ CAN-to-Ethernet Adapter.